Hello! Happy weekend everyone! Today I have another card for one of Amber's Viva La Verve challenges! This one is for the second October challenge -- details here. 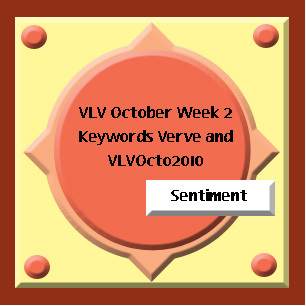 I used more from the new Verve Autumn release on this one! In addition to the sketch, we were to use the colors Brown, Orange, Turquoise and White. I started with some patterned papers from Crate Paper School Spirit. 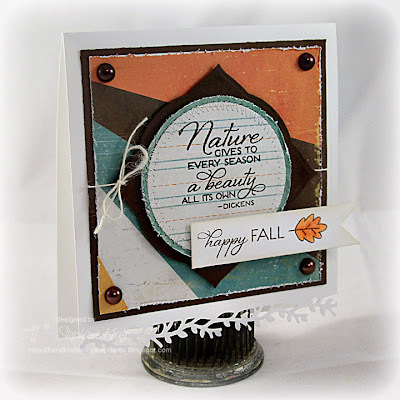 I embossed the Every Season Plain Jane stamp with Chocolate Brown embossing powder. The Dickens quote reads, "Nature gives to every season a beauty all its own". The sketch has a sentiment panel over the larger circle. Since I used a quote instead of an image, I was going to replace the sentiment panel with an embellishment, then I thought how wonderful this quote would be to create a card for each of the seasons. "Happy Fall" is from the same named set, Happy Fall, and the leaf is one of many lovely ones in Autumn Splendor. Accessories: Labels Three Nestabilities, Standard Circle - LG and SM Nestabilities (Spellbinders); Woodland Branch border punch (Martha Stewart), Markers (Copic), Pearls (Prima), Twine (May Arts), Distress tool, Foam tape, Thread, Sewing machine. LOVE this Steph! FAB paper and stamps! Such a fabulous card! I love that paper! Very pretty fall card Stephanie! What a wonderful sentiment & perfect take on the sketch! Love the background paper and great take on the sketch! Beautiful card!